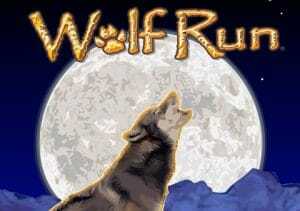 The wilds of North America is the setting for Wolf Run, a Native American themed video slot powered by IGT. It’s a 5 reel, 4 row, 40 payline game that comes with stacked wilds and a free spins feature. Play from between 40p and £800 per spin. Set against a dense forest and snow-capped mountain backdrop, the reels in Wolf Run are dominated by animal and Native American style imagery. Joining the lower value playing cards from A to 9 are a pair of wooden totems which pay up to 250 coins and a white wolf and grey wolf, both of which pay up to 400 coins. The howling wolf silhouetted against the full moon is the game’s wild. It substitutes for all other symbols with the exception of the bonus scatter. Landing 3, 4 or 5 wild wolf symbols in combination will net you 50, 200 or 1,000 coins. The wild wolf can land fully stacked and fill up multiple reels. The Native American necklace is the scatter – land 3 of the them on the middle 3 reels and you’ll win a prize of double your total stake as well as triggering the Free Spins Bonus feature where you’ll be awarded an initial 5 free spins. These free spins play out on a new set of reels with the backdrop turning from day into night. More importantly, extra stacked wilds are added to the reels during the feature to improve your chances of securing a winning combination. You can add to your tally of spins by landing another 3 bonus symbols on the same free spin which will get you another 5 free spins – there’s up to 255 free spins to be earned. Wolf Run has the look and sound of a brick and mortar video slot – the design is solid without being spectacular and the bangs and bleeps on the backing track will be familiar to anyone who has spent any time in a live casino. The variance here is in the medium range with the free spins coming along at decent enough intervals. Wolf Run isn’t the most exciting game you’ll ever see. Get a full complement of stacked wilds though and it could leave you howling with delight. IGT has also released a MegaJackpots version of the game which is identical but offers you the chance to win a life-changing progressive jackpot.